Are you accepting credit card? We offer several types of small business loans that can give you better options depending on your individual financial situation and business profile. Our Funding Specialists will help determine what kind of loan is appropriate for you based on how much money you need, how quickly you need it, and what kind of repayment terms you want. Our merchants are our family and we take care of our family. If you are new to accepting credit cards, we simplify the process for you. We will set you up with an easy-to-use credit card terminal that is pre-programmed for your merchant account and your business will be processing credit card payments within minutes. Our merchant services support is also available 24/7 to make your life easier and your business better. between confusing rate offers from different processors. We can create a custom processing rate for your business if this "Out of The Box" pricing plan does not work for you. Just contact us, and we will even review your current statement and provide you with a savings analysis. We can create a custom processing rate for your business if this "Out of The Box" pricing plan does not work for you. Just get in touch—we'll even review your current statement and provide you with a savings analysis. How soon can I start accepting payments? Our simple online application takes only 5 minutes to complete. The approval process is usually within 24 hours. Once you are approved a Betterpay merchant account specialist will contact you to go over your equipment and account details. How fast are funds deposited into my business account? Funds are typically* deposited into your business account within 24 hours. What is true cost plus 0% markup? Every time a customer uses their credit card, the merchant must pay a small percentage of the transaction to the card brand (Visa, MasterCard, Discover, Amex,). This fee is known as interchange which is the true cost of processing. Unfortunately, many processing companies attach their rates on the true cost. Many merchants are unaware that they are paying an unnecessary markup. 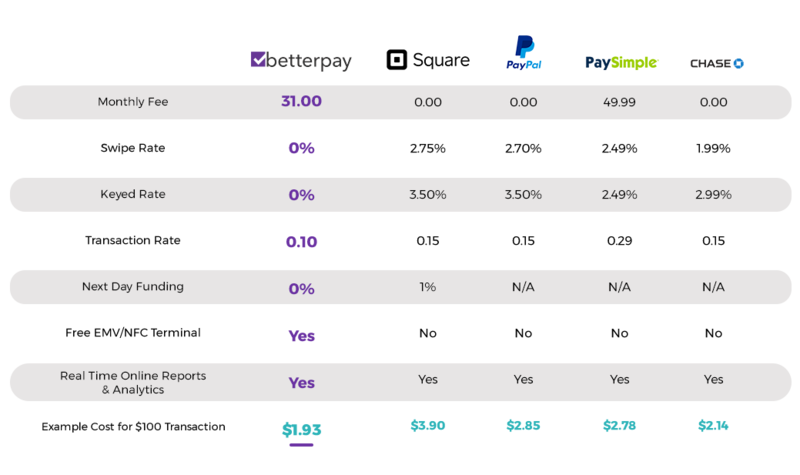 At Betterpay, we never profit from rates that's why we introduced 0% markup, meaning our merchants never pay more than the true cost to process credit cards. What makes Betterpay better than other merchant services providers? At Betterpay, we have simplified the payment industry by creating a better merchant experience. We are committed to delivering better services through technology, pricing, and support. As we believe the future of payments is a world where merchants only pay the actual cost to process credit cards.